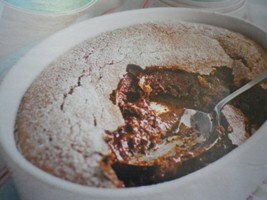 This is a very quick and easy chocolate pudding to make – one that all the family will love or is great for a supper party. Preheat the oven to 180°C, fam 160°C gas 4. Place the chocolate butter and sugar in a saucepan over a very gentle heat until melted. (It will not matter if the mixture is a little grainy as the sugar will melt when it is baked in the oven). Take the pan off the heat and stir in the beaten eggs, ground almonds and the flour. Tip into a 1.5 litre ovenproof dish and bake for 25-30 minutes. The mixture should still be gooey inside. Allow to cool slightly and then dust with icing sugar. Serve with ice cream, or cream and if you wish to make the pudding even more decadent add a dribble of chocolate sauce to the pudding when it is served. See the recipe below for a lovely rich but not at all bitter chocolate sauce. In a medium sized pan heat the water and sugar, stirring constantly to dissolve the sugar. Bring to the boil and continue to stir until all of the sugar has been dissolved. Break the chocolate into small pieces and cut the butter into small chunks. Add to the pan of water and sugar and stir. It is best to use chocolate with over 50% cocoa solids – but if your family would prefer a less rich version try making the sauce with half milk chocolate and half dark. Remove the pan from the heat and stir the sauce until the chocolate and butter have melted and all the ingredients have blended together. Stir in the cream and the vanilla essence. Serve the chocolate sauce immediately whilst it is still warm.